I mean, the damn thing as much fun as the TEX I'll give you that. Well my Heed bars looked like this after the Kielder 500. I've dropped my previous bikes before whilst learning and I mean dropped not crashed and they've saved their price in body parts for sure. But this was a slightly faster crash and including replacement bars at £150 the parts bill was £500. The tiny panel by the clear wind deflector was £100 on its own. If I'd needed the section along the tank then I dread to think what the bill would have been. Anyone con drop a bike or have it knocked over by someone else. Each time that happens, the bars are paying for themselves. I'd love to be able to say I've never dropped mine but I have. Stuff can just catch you out. The Missus has dropped her 800 a few times, but a quick rub down and a spray and she's as good as new. Following a drop they repair invisibly. Following a slow fall, they're pretty much consumable items - I wish they sold them in single sides! Once they're bent, they're no good really. In terms of a high speed crash, well if I'm honest I think the bikes going to be a write off regardless of bars or no bars. Just check out Triumph body panel parts and decide whether £150 for Heed, Motech etc is good insurance. (hard to be affirmative from such a low FPS clip, but the biker on the video seemed way too fast and/or distracted for the road conditions). While the rider in the video did a herculean job of staying upright and not getting knocked into the center barrier, I think that he was speeding and that the accident was probably avoidable if he had been vigilant. 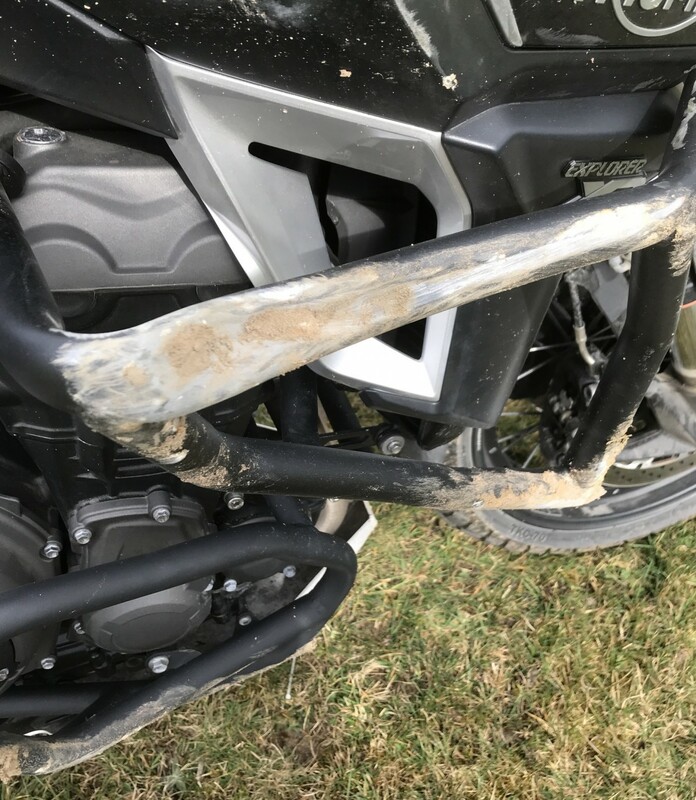 100% it was the rider's fault - he was going too fast for the conditions. Doesn't depreciate the value of the upper crash bars in the tiniest bit and proves how good they are to keep us safe in similar situations, or even simple falls whilst standing, alas, this is a video of how not to ride in urban conditions. Everybody else is out to get you, be and stay vigilant. You may be right, but chances are you will be injured more than the cager. Reminds me of a saying that I heard from an RCMP officer who was teaching traffic awareness: "The cemeteries are full of people who had the right of way."